Spring is only a few days away, but it doesn’t feel like it today. Cold, damp, and raining. So a colorful spring card seemed like just the thing to chase away a dreary day. Added to the House Mouse and Friends Monday Challenge “Spring is in the Air” HMFMC189. Oh this is simply adorable!! 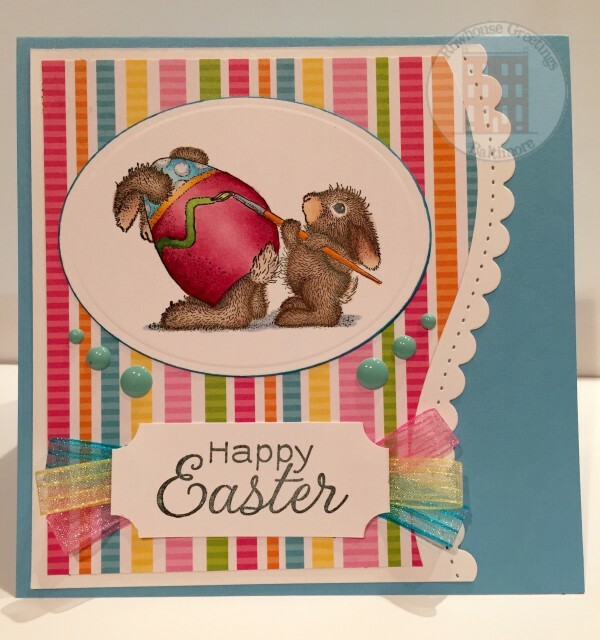 The colours are so bright and cheery…your image is one of my favourite Easter images!! Thank you for sharing with us at House Mouse and Friends!! Good luck! Thank you Beth! It certainly did cheer up a rainy day here. Brilliant card! I love the bright spring-y colors and the papers and ribbons are fabulous. Thanks for joining us at House Mouse and Friends Monday Challenge. Thanks Snoopy! The ribbons were a lot of fun. I just happened to have colors to match the paper.